The city of Pearls has so much to explore beyond the famous Biryani and Haleem. Why not explore these 10 best places to unleash the rich culture and heritage of Hyderabad. 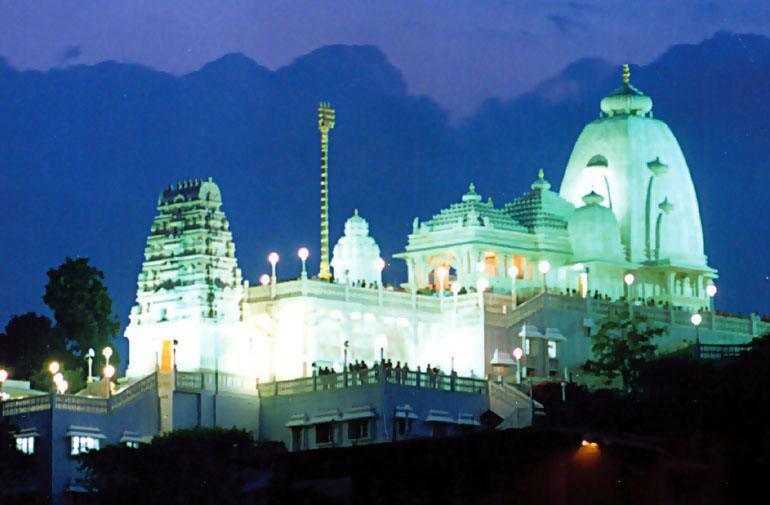 Situated in the heart of the city, on a hilltop, it is one of the most famous temples in the city. The temple was constructed by the Birla Foundation. The idol of Lord Venkateshwara is about 11 feet tall and the atmosphere around the temple is very peaceful. The temple does not have traditional bells, making it suitable for meditation. 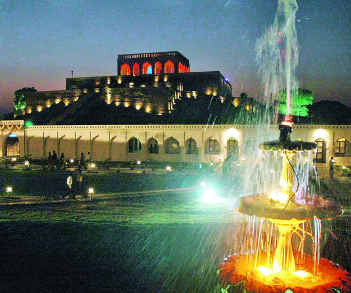 As we head towards the Southern parts of the city we are surrounded by the sumptuous Nawabi Culture. The mornings there are filled with the aroma of the Irani Chai. The taste of it is multiplied when it is accompanied by a plate of kheema Samosa. The 400 hundred-year-old monument has witnessed many stories which remain untold. As the name suggests the four Minarets (pillars) are supported by four grand arches leaving one wonder how beautifully it was designed. After, taking a look at the Charminar no one would want to leave the place without shopping at the famous Laad Bazaar. It is said that it was set up Mohammad Quli Qutab Shah at the time of his daughter’s wedding. It is named after his daughter’s name Laad. 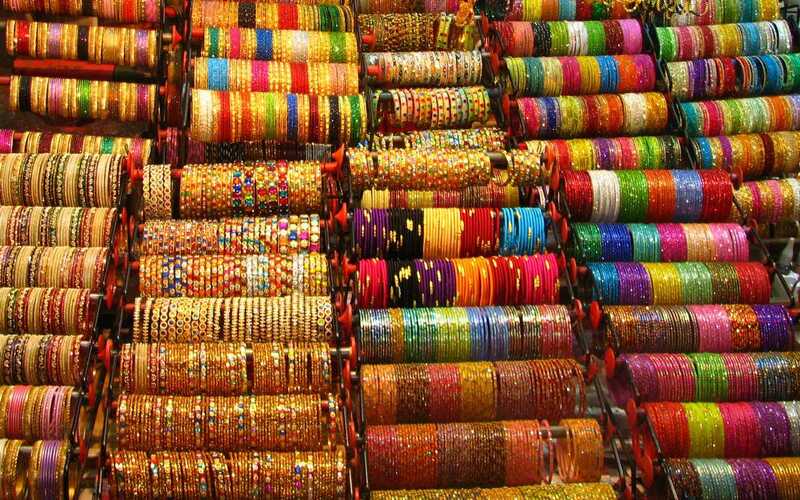 It has a rich collection of bangles made out of lac which is decorated with stones. Not only bangles but it is the house for jewelry and accessories. A walk in this road will leave you awestruck by the artisan’s skill. Right next to the Charminar is this Persian style palace with its opulent Durbar Hall. The palace is unique for its style and elegance. The palace also showcases the rich collection of the Nawabs. Right from their clothes to the utensils all of them clearly explain the lifestyle of the ruler. In addition to this, the collection of cars used by the Royal Family leaves you dumbstruck. This is situated towards the west of the city. This was the home for some of the world-famous diamonds like the Koh-i-Noor. It is an architectural wonder. Fateh Darwaza is an example of one such fantastic acoustical effect, which is one among the many famous engineering marvels at Golconda. Clapping your hand at a certain point near the dome entrance reverberates which is heard clearly at the hilltop pavilion, almost one kilometer away. This was served as a warning note to the inhabitants of the fort of any impending danger. Of course, it now amuses the visitors. The Mahankali temple in the palace is one of the examples that depict the deep mix of culture. The Telangana state festival Bonalu starts here every year. A kilometre away from the Golconda Fort you find these beautifully carved stone works. They contain the tombs and mosques built by the various kings. The tombs are structures with intricately carved stone works and are surrounded by landscape gardens. Tired of your journey? Then you are at the right place. Situated on the banks of river Musi, this is the place where Taramati and Premamati, the two dancers of the Abdullah Qutub Shah who was the Sultan of Golconda, used to perform dances. Taramati Baradari has astonishingly fine acoustics that her voice would reach the Sultan at the Golconda Fort, which is lesser than 3 km away. When we are in the city of Nawabs one of the most important places to look for is the Mosques there. 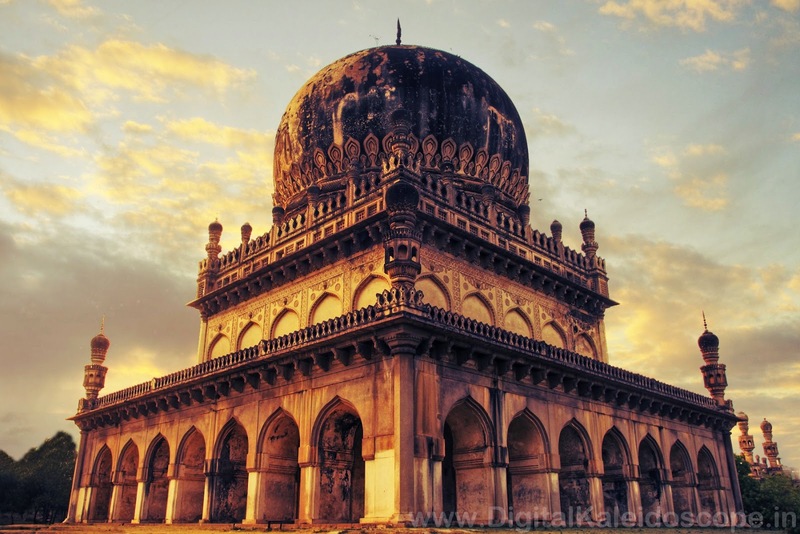 Hyderabad has a huge number of Mosques built during the reign of Qutub Shahis and the Nizams. Mecca Masjid is one of the largest mosques in India, with a huge capacity of 10,000 worshippers. Close to Charminar, the mosque is located in the old city. It was built by Muhammed Quli Qutb Shah. It is said to have been built with bricks made from the soil brought from Mecca, and hence it got its name. 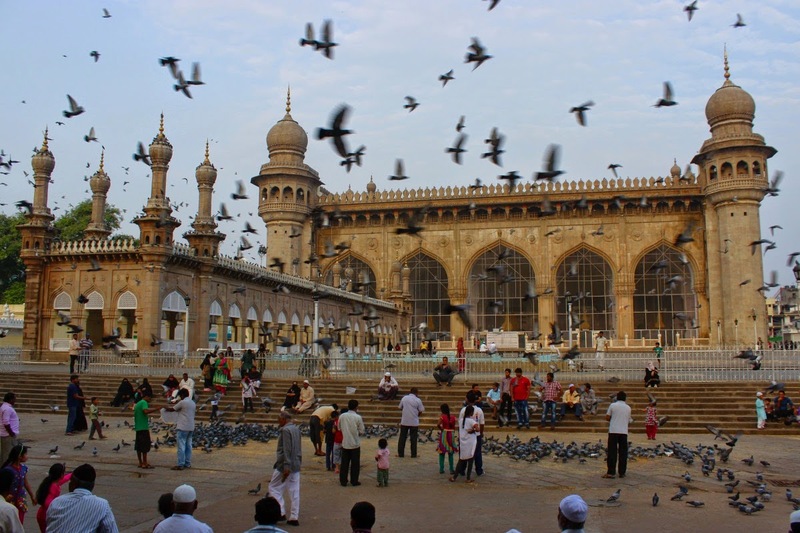 While you visit this place the pigeons around and in the background of Charminar give a fulfilling experience. Are you an art lover? Then this is the place one must not miss out. Depending on ones love for art you can spend hours or stay there for a couple of days admiring the beauty. It showcases the rich collection of various rulers and also their taste and interest towards arts. It is one of the largest museums in the world. It has a huge collection of clocks. At the end of every hour, a timekeeper emerges from the upper deck of the clock to strike a gong as many times as it is the hours of the day. The clock is an antique. After having a long day visiting these entire places one would surely want to have a great evening. This can be ensured by your visit to one of the World’s Largest Heart Shaped mark. It is spread across 5.7 km and is fed by the river Musi. The boat ride and the high monolithic statue of Lord Buddha add to its beauty. The perfect evening in Hyderabad cannot be completed without spending some time at this beautiful spot.